The value of property deals transacted in Dubai in the first six months of the year fell despite a rise in the number of transactions. According to figures from the Dubai Land Department published yesterday, the total value of real estate transactions in Dubai fell 12.4 per cent to Dh113 billion in the first half of 2016 from Dh129bn during the same period a year earlier. However, the DLD reported that the number of transactions taking place over the period increased by more than a fifth, rising to 28,251 sales, mortgages and other transactions in the first half of 2016 from about 23,000 a year earlier. The total value of new mortgages taken out during the period fell by a quarter to Dh48.3bn from Dh65bn a year earlier. And the total value of sales transacted without a mortgage fell 8 per cent in the first half to Dh48.7bn from Dh53bn last year. The DLD said that Business Bay remained the most popular area of Dubai for unit sales, with 1,643 transactions valued at Dh2.3bn – down slightly from Dh2.5bn last year. Dubai Marina was the second most popular area for unit sales – 1,392 transactions took place during the period with a total value of Dh2.89bn. Warsan 1 was third with 999 transactions with a total value of Dh454 million. “Dubai has achieved a high percentage of growth, with the value and the number of real estate transactions, which provides reassurance about the positive development that the Dubai property market is witnessing, and proves the attractiveness of the Emirate’s real estate,” said Sultan Butti bin Merjen, the DLD director general. 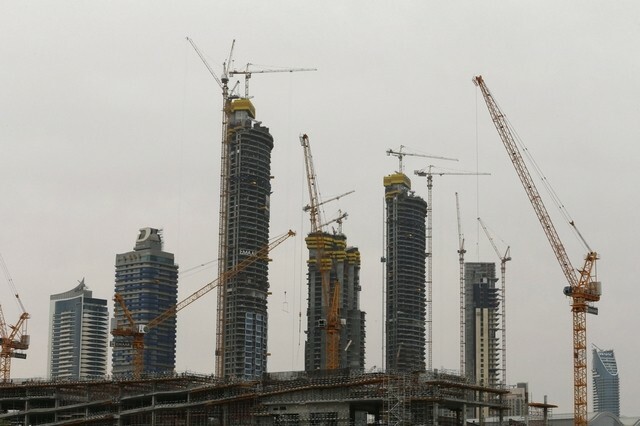 The news came a day after property broker JLL predicted that the UK’s vote to leave the European Union will delay the Dubai housing market’s recovery by six months. After two years of falling house prices, JLL previously forecast the emirate’s residential market would start to recover towards the middle of this year or later. However, with British nationals making up the third-largest group of foreign investors in Dubai property and the value of the pound down more than 10 per cent since the Brexit referendum last month, the broker has revised its forecast to next year. According to JLL, house prices remained flat in the three months to the end of June, meaning that average Dubai house prices now stand about 15 per cent lower than the last market peak, in mid-2014.